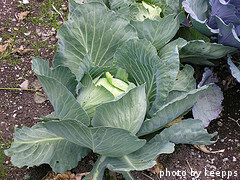 Fertilizing and watering cabbage plants is important because they are such heavy feeders. A lack of food will stunt their growth, leading to undersized and poorly developed heads. They use water to absorb the nutrients from the soil. Additionally, cabbage has a high water content, so without enough water, the heads will dry out, crack and become bitter. Cabbage needs about 1 1/2 inches of rain per week for best results. If you don't get this much rain in your area in a week, you'll need to water your cabbage plants yourself. You can use a soaker hose, jugs, or a regular hose to get the job done. If no rain falls in your area, give your cabbage plants one good, deep soak per week. This method is much better than several shallow soaks as cabbage roots run deep. When watering cabbage plants, keep the water pressure low to avoid eroding away the soil around the plants. It's a good idea to focus your efforts at the base of the plants. Watering the tops of the plants can encourage pests and diseases. It's also a good idea to water in the early morning hours. That way, any excess water that may have gotten on the leaves will be evaporated by the afternoon sun. Cabbages are thirsty plants and it's important that they get enough water. However, like other plants, they don't do well if they sit in soggy soil for too long. When in doubt, dig down a few inches into the soil next to your plants. If the soil is bone dry 3 inches down, you need to water. If it is moist, you're likely in good shape. As mentioned before, cabbage plants are heavy feeders and will do well with a couple of doses of fertilizer throughout the growing season. You can add fertilizer to the soil just before transplanting cabbage seedlings. 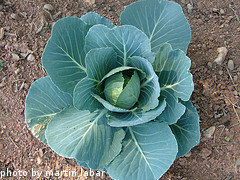 Choose a well-balanced granular fertilizer and sprinkle it over the area where you intend to grow cabbage. Till the fertilizer into the soil. 10-10-10 or 12-12-12 fertilizer works well. These three numbers are located on the side of the fertilizer package and tell you how much nitrogen, potassium and phosphate are contained in that particular fertilizer. Most granular fertilizers are applied at a rate of 1 1/2 pounds per 100 square feet of garden space. Check the label on the fertilizer package and follow the manufacturer's directions for the rate of application. 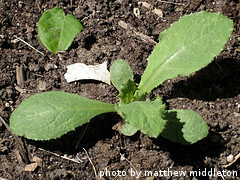 Once the seedlings are about 6 inches tall, you can fertilize them again with a well-balanced water soluble fertilizer. Just mix it with water according to the manufacturer's instructions and spray around your cabbage plants. 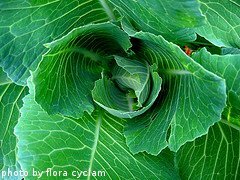 At this stage, it's better to avoid granular fertilizers as they will burn the cabbage plants if they come in direct contact. When the cabbage plants begin to form heads, a second dose of water-soluble fertilizer can be added. This will give the plants the energy they need to produce large, nicely formed heads. Now that you know about fertilizing and watering cabbage plants, it's time to learn about harvesting cabbage.